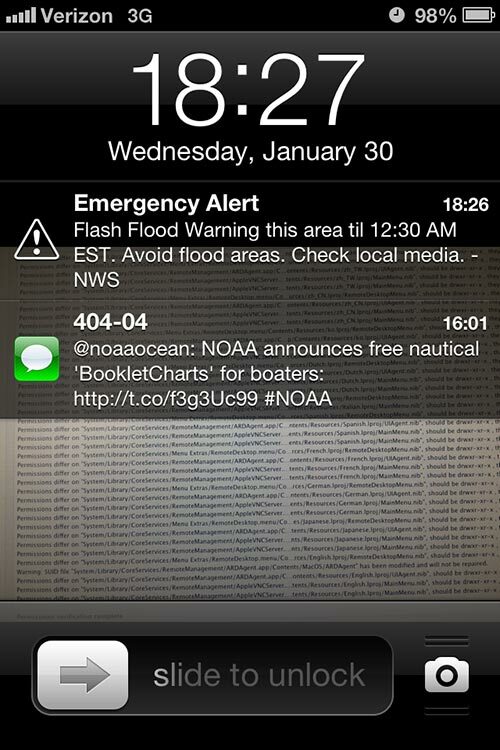 Figure 1: The Emergency Alert appeared at 6:26 p.m. on Wednesday, January 30, warning of flash flooding in the local area. It was gratifying to see that my iPhone was working to save my life. For a slightly larger version, click on the image. I was on the 9th floor of a building at the top of a hill, and not overly concerned about drowning in a flood. But I was fascinated with how the alert appeared on my work phone, and why it didn’t appear on my personal phone. I wondered if it had anything to do with the fact that my phone was an older model. I checked with my spouse, as she has a spiffy new iPhone 5 (with an AT&T service plan), but no, there were no alerts on her phone. No such alert appeared on our personal phones, so I sent a message to my colleagues, asking if any of them had received alerts. A couple of them had, and I found the common element: if you had an iPhone with a Verizon service plan, and you were in an area under flood warning, you received the alerts. Eventually I found a FEMA (Federal Emergency Management Agency) web site that gave some background to the Commercial Mobile Alert System (CMAS) and Wireless Emergency Alerts (WEA). Wireless Emergency Alerts are sent by a partnership between public safety officials and wireless carriers (telephone and pager companies), and the web site notes that most alerts will come from the National Weather Service, as noted by the “NWS” notation in the two alerts I received. The alerts are free; you are not charged for them under your message plan or as part of your service contract. The alerts are also location-aware; if your home is in Maryland but you are visiting Kansas, you will be alerted to an emergency event in Kansas – provided your service provider is a CMAS partner. Apparently AT&T doesn’t care if I get washed away in a flood, but Verizon does. To find out if your iPhone is set up to receive alerts, launch the Settings app, and select Notifications. Scroll all the way to the bottom, and see if you have a section titled Government Alerts (Figure 2). If you do, consider turning the alerts on if they aren’t already. Figure 2: In your iPhone Settings app, select Notifications and scroll all the way to the bottom. If you see options to turn on government alerts, please do so. 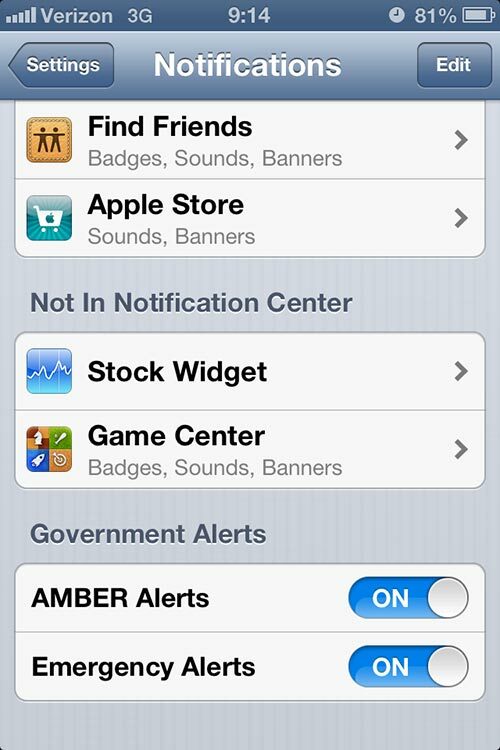 AMBER (America’s Missing: Broadcast Emergency Response) Alerts are usually sent out for missing or kidnapped children. The second option, Emergency Alerts, is mostly for weather alerts, though FEMA envisions that they could be for other widespread emergencies, as determined by local authorities. For a slightly larger version, click on the image. Does this mean the government is spying on me? These alerts do not mean the government is spying on you, but rather the reverse. Instead of the government tracking your iPhone, which is expensive and technically difficult, your iPhone essentially “subscribes” to the alerts and, based on your current location, periodically asks: “Am I about to be threatened by fire? Flood? Alien invasions? The sun going nova?” If an alert is active for your location, it is sent to your phone, the phone beeps (and vibrates, if you have it set up for vibrate), and you get the alert. The FEMA site claims that “all major cell carriers” are participating in Wireless Emergency Alerts, so it isn’t clear why AT&T phones don’t offer these alerts in the Notification settings. I tried to contact AT&T and ask why they didn’t love their customers enough to warn them, but received no response. Note: shortly after this article was published, AT&T quietly started offering emergency alerts to their customers. To check if your phone is set up to receive them, consult the instructions shown above.